My classical training and Jazz roots have taken their lovely toll on my proclivity for well-crafted songwriting informed by a jazz sensibility. My father was a composer, band leader and drummer thus it’s no wonder I love a swung tempo (my corruption of the term). Though I perform music that conveys a wide range of genres, I am at heart a jazz musician and incorporate music from the American Songbook in my repertoire. I take pride in my performances and am lucky to play with some absolutely fantastic local musicians. Well, because I’m seasoned, have a voice people want to listen to, put on a solid show, don’t drink or smoke on the job, truly care about increasing your sales receipts, don’t compete with your guests for volume (i.e. don’t turn up), and play with great players who happen to be renowned professionals as well as kind, considerate people you’d want to take home to your Mom. 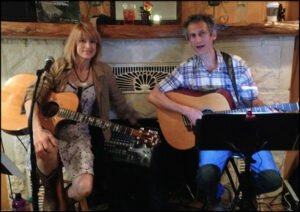 Musically I hold fort monthly with Monte Mann (Held & Mann) at a culinary gem in Wimberley (since 2011). Linda’s, owned and operated by Jimmy and Linda Ash, has been on the scene since 1991, a beloved catering outfit and gourmet restaurant serving chef-prepared comfort food in an old stone house in the Hill Country. Before that I performed as a solo artist for many years touring and playing in and around Austin. I was fortunate to play in songwriter venues like the Cactus, the Saxon Pub, Momo’s, the Bugle Boy, Anderson Fair and Eddie’s Attic and worked for two years with guitar wizard Andrew Hardin (Tom Russell). I was finalist in the Kerrville Folk Festival’s yearly songwriter competition and won awards in national and international song competitions. I consider it an honor and a privilege to play and be paid. I also appreciate the hard work and dedication it takes to run a business incorporating live music thus I make it a priority to make your life easier when you hire me! See you at a gig! “Paula Held began playing music at my restaurant on February 11, 2011. Although crowds in a restaurant are always unpredictable, she has managed to develop a loyal local following and has drawn people from Austin to San Antonio. I have owned a bar, managed and owned restaurants and been a professional musician all of my life. For ten years I wrote a music column. In that time I have seen many hundreds of performers and learned to judge their quality of performance. Very few reach her level of excellence. When Paula picks up her guitar and adjusts her microphone at the beginning of her set, her audience never knows what direction she’ll take. Her tastes are eclectic and her abilities comprehensive. She slides effortlessly from country to jazz standards, to soft rock. When she sings a torch song she sounds like she was tutored by Julie London. When she sings the blues, the intensity of her delivery can cover anyone’s lyrics (though I’ve never heard her cover Mississippi John Hurt). Her own singer/songwriter creations also scan several genres and are remarkably crafted throughout. But here’s the thing, whatever she plays, in whatever direction she steers her performance, it is all indelibly Paula. This is no cover copy singer. Though her scope forestalls any boredom at the front tables, it never loses that sense of artistic integrity so essential to a great performer. Whatever the genre, Paula is forever Paula. With a voice that is at once soulful and controlled and a guitar that plays any direction with seeming ease, she stays at the emotional center of of her music, whether it is pain, love, or joy she is projecting. Copyright © 2010-2019 Paula Held. All Rights Reserved.